The Aboriginal Art Directory artist spotlight with Adam Hill was republished in the Koori Mail this week. They say art is a weapon. 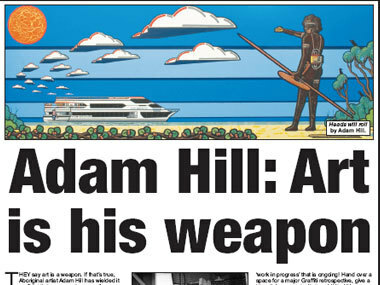 If thatʼs true, Aboriginal artist Adam Hill has wielded it confidently to carve out a name for himself. The Sydney-based Worimi man is currently preparing for his next solo show at Melbourneʼs Arc1 Gallery in November. Hill, who has invoked such descriptions as ʻan exemplar of the urban blackʼ*, likes to push boundaries with his often-political work. He says he hopes, by the time his work hits the secondary market, to become a major contributor in establishing resale royalties to the benefit of Australian artists and their families. "I will have pushed the boundaries of sedition, offended the offensive, defamed the defamatory and exposed the ex-officios," said the graphic design graduate, cartoonist and didgeridoo performer. Read the Aboriginal Art Directory artist spotlight with Adam Hill.